On February 28, British costume designer Jenny Beavan won her second Oscar at the 88th Academy Awards Ceremony for her work on Mad Max: Fury Road. Unfortunately, there was more attention given to what she wore, than the Oscar achievement itself as is often the case with women. As Beavan approached the Dolby Theatre stage to accept her award -- a sea of gob-smacked film-elite (including Four-time-Oscar-winning director Alejandro Iñárritu and Spotlight director Tom McCarthy) stared, gasped and giggled at Beavan's attire, many refusing to even applaud the talented designer. Unlike Icelandic artist Bjork who chose to wear a dress resembling a swan to the 2001 Academy Awards, Jenny Beavan decided to dress low-key and comfortable, donning a black leather jacket with a studded skull on the back, black slacks and a scarf. Beavan is reported to have told the Telegraph: "I don't do frocks and absolutely don't do heels, I have a bad back." I always believed that feminism was about supporting women in their choices, but apparently not if the last 48 hours is anything to go by. Female celebrities, journalists and commentators from around the globe jumped on the 'Let's bag Jenny!' bandwagon. Not only has Beavan's choice of clothing been targeted, but also her make-up (or lack of it), weight and hair. I don't recall any men who work in the film industry being under this much scrutiny Oscar night, why is that? Could it possibly be because there is a different set of rules for each gender? In 2006, 'It's Hard Out Here For a Pimp' won the Oscar for original song. Jordan Houston, Cedric Coleman and Paul Beauregard were all dressed casual -- in jeans, over-sized tees and caps. No-one said boo. So casual attire at the Oscars is okay for male rappers but not okay for women? This is a woman who has been awarded an Academy Award for Best Costume Design for two films -- A Room With a View and Mad Max: Fury Road. This is a woman who has received eight additional Oscar nominations. This is a woman who has won a BAFTA award and been nominated for a Tony Award. This is a woman who has been working in the film industry since the 1970s and people want to talk about whether she put a brush through her hair? Are you kidding me? The worst part of this story is that Jenny Beavan was made to feel that she should justify herself. "I just like feeling comfortable, and I'm sorry, as far as I'm concerned, I'm really dressed up." The woman just won her second Oscar, she needn't justify herself to anyone. If anyone needs to justify their behaviour, it's the audience members who didn't applaud and the nasty media commentators. What occurred as Beavan walked up to the stage is a form of shaming. It takes bravery and courage to be yourself in a world that wants you to be something else. I applaud Jenny Beavan for putting comfort and the health of her back before fashion and societal expectation. Who cares if she didn't glam up in a gown and six-inch stilettos that massacre one's feet. Her decision was an intelligent one -- health, comfort and posture-wise. One has to question whether it would be as newsworthy if she was a man? I get the feeling it wouldn't. I think we all know that a male would be rated on his achievements not his clothes. Women are far from having equality with men. 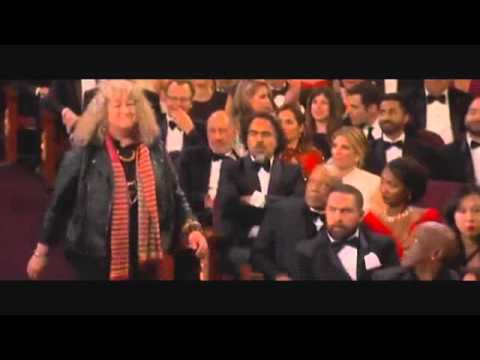 The cruel and unnecessary mocking of two-time-Oscar-winner Jenny Beavan is proof of that. This isn't about breaking a traditional dress-code. This is about an obviously gifted woman being judged on her appearance rather than her merit.